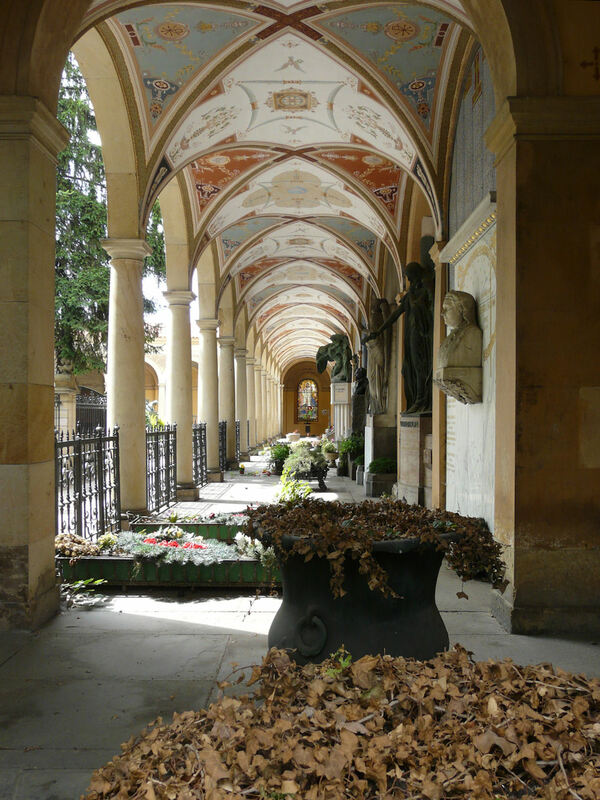 Vyšehrad cemetery was established in 1869 as a national burial ground for eminent Czechs from all walks of life, but especially those from the arts, the sciences, and the world of politics. 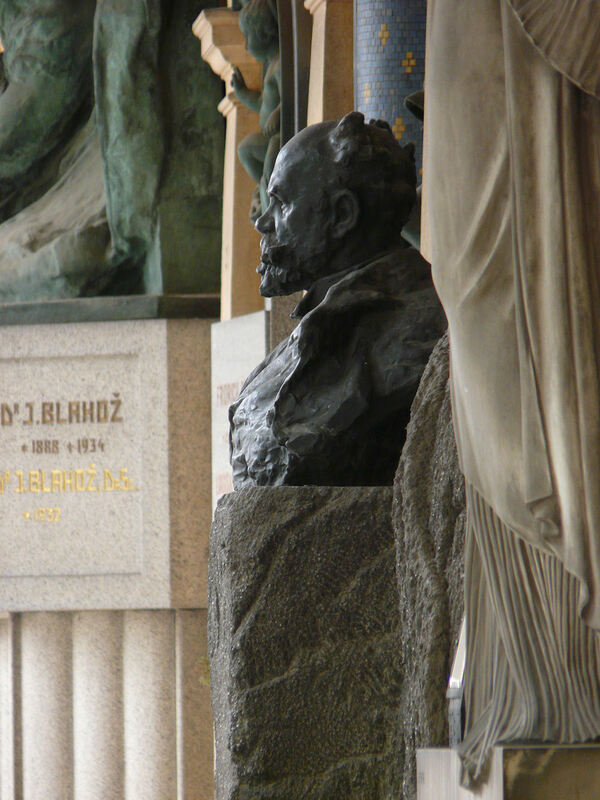 Among its well-known residents are the composers Antonín Dvořák and Bedřich Smetana, the writer Karel Čapek, the artist Alfons Mucha, the poet Jan Neruda, and the operatic soprano Ema Destinnová (Emmy Destinn). And of course, many of the nation’s foremost architects are buried here too, including Josef Mocker, Antonín Barvitius, Josef Gočár and Karel Hilbert; and the sculptors Josef Myslbek, Stanislav Sucharda, and Ladislav Šaloun. Keeping them company is the architect Antonín Wiehl, who designed the beautiful renaissance-style arcades that run around the northern side of the cemetery. Wiehl was also responsible for the grandest gesture of all, the ‘Slavín’, or pantheon, set into the cemetery’s eastern wall. 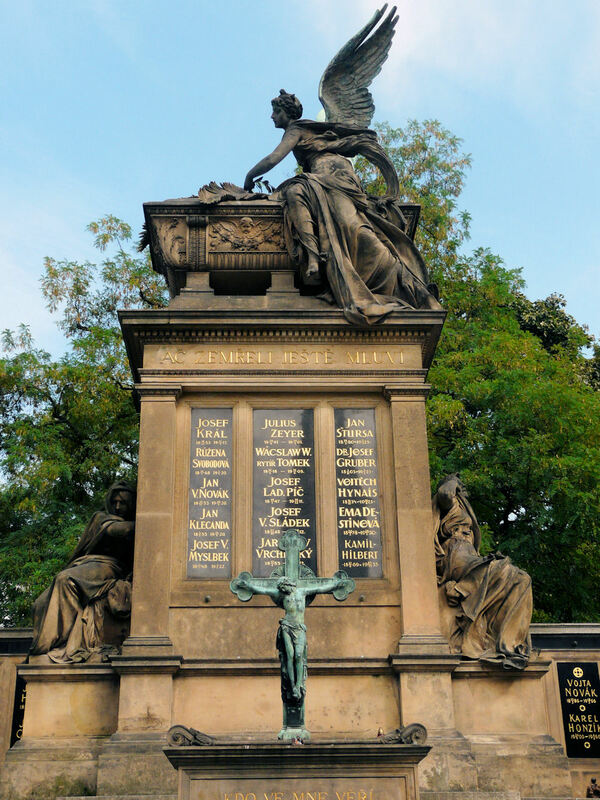 This vast monument and tomb holds the mortal remains of 55 preeminent Czechs, their names inscribed forever on marble plaques. The allegorical figures to either side by Josef Mauder represent the Nation in Mourning (left) and the Nation Victorious (right), and above them, resting against a sarcophagus, the winged figure of the genius patriae, the Spirit of the Motherland.